If he is remembered at all today, Cassius Marcellus Clay is recalled solely because that was the name of Muhammad Ali, the boxer, before he converted to the Nation of Islam and changed his name. Ali had been named after his father who was also named Cassius Marcellus Clay in honor of the man who freed his great-grandfather. Cassius Marcellus Clay, called Cash by his intimates, was a Kentucky abolitionist. 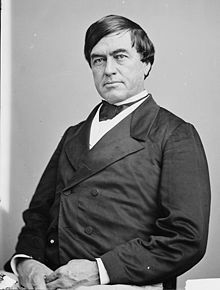 A cousin of Henry Clay, Cassius Marcellus Clay was born on March 19, 1810 to Green Clay, one of the wealthiest plantation owners and slave masters in the Blue Grass state. His father’s wealth ensured that he was well educated, first at Transylvania University and then Yale. While at Yale in 1832 he heard the abolitionist William Lloyd Garrison speak and was converted to the anti-slavery cause. Going back to Kentucky he served three terms in the Kentucky House of Representatives, his political career being cut short, due to the unpopularity of his anti-slavery views. In 1845 he began to publish an anti-slavery newspaper, The True American. His life continually under threat in his native state, Clay went armed constantly with tow pistols and a Bowie knife. He protected his home and office with the assistance of a cannon. During the Mexican War he served in a Kentucky cavalry regiment as a captain, and was captured by the Mexicans near the town of Saltillo while on scouting mission in January of 1847 just prior to the Battle of Buena Vista. In 1853 he donated 10 acres in Kentucky for the foundation of Berea College, one of the nation’s first interracial colleges. His fame as a southern abolitionist caused his name to be put forward at the Republican convention in 1860 as a candidate for Vice President, prior to Hannibal Hamlin obtaining the nomination. An enthusiastic supporter of Lincoln, Clay was rewarded with the ministership to Russia from 1861-62 and again from 1863-1869, during which time he helped negotiate the purchase of Alaska from Russia. He died in 1903, his later years marked by financial hardship, declining mental faculties and scandal. His wife of 45 years divorced him, finally fed up with the infidelities on his part that marred their marriage. He made headlines throughout the nation when at 84 he briefly married a 15 year old, before divorcing her. Some men, sadly, outlive their time, and Clay was one of those men.